On September 18th, 2018, Carlos Monroy walked into an operating room at Español Hospital in Mexico City, and what happened next changed his life forever. He was there because he had made the small piece of plastic that would be carefully implanted onto the skull of the patient lying on the table. The patient’s name was Adriana, and when Carlos saw her the following day in her recovery room, he knew from the smile on her face that her life had changed forever, too. “Since I was little, I wanted to help people,” says Carlos. As a young student in Mexico City, he worked hard in school, earning degrees in industrial design and aeronautical engineering before finding a job at General Electric Aviation working on aircraft engines. He then decided to move to the UK, where he completed a PhD and two post doctorates at the University of Cambridge and Swansea University that led him to do more work in the automotive and medical device industries. It was during this time that he came up with the idea for his company, Granta, named after the stretch of river in the English town of Cambridge where Carlos had studied. The objective of the company, which Carlos founded in Mexico, would be to take all of the knowledge he’d gained so far in his career and to channel it back into his childhood dream of helping people. 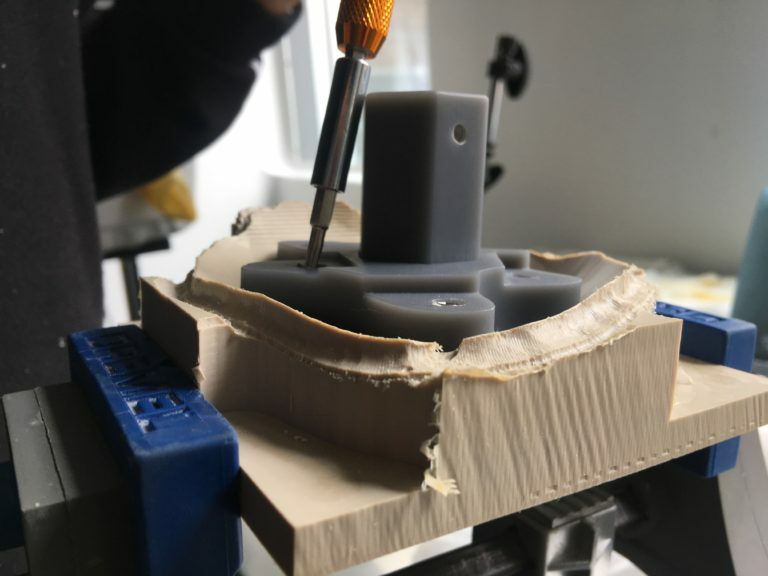 He realized that his work with materials in the automotive sector, paired with some of the latest technological advancements in digital fabrication, could be applied to medical devices and that it could be a real, working business. It hasn’t been easy—starting a company is difficult, and it’s even more difficult to start a company in Mexico, and even more difficult to start a company in the health sector in Mexico. Granta would design and fabricate customized bone implants for patients who desperately needed them. To start, they would make implants for the human skull. “It hasn’t been easy—starting a company is difficult, and it’s even more difficult to start a company in Mexico, and even more difficult to start a company in the health sector in Mexico.” It took Carlos and his business partners more than two years to gain the necessary permits and approvals from the Mexican government. 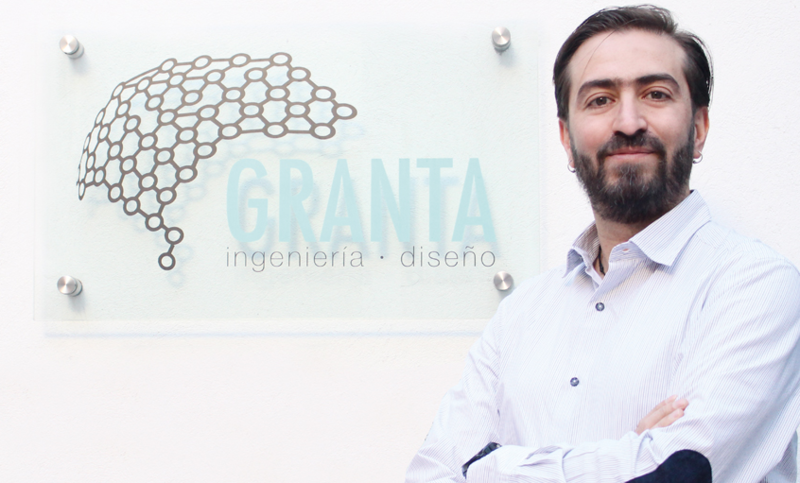 Granta was the first-ever Mexican company—and one of just six or seven companies in the world— to design custom skull implants. Right as they were opening their doors, they received a call from a local doctor and just like that, they had their first patient. Adriana’s case was a tricky one. 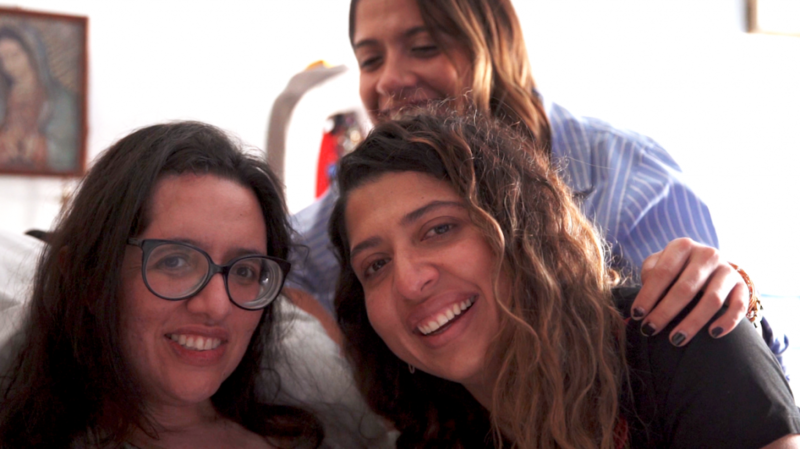 She had been a happy and healthy woman living in Mexico City with her husband, Jesus, before she suffered an aneurysm that put her in a life-threatening condition. After surgery to repair the injury failed, doctors told her and her family that they would need to perform a craniotomy (a procedure to remove part of her skull) in order for her brain to decompress, and to save her life. Today there are four primary ways to do a skull implant, or cranioplasty, to replace the bone removed during a craniotomy. The most common method is poly methyl melacrylate (PMMA) implants, which are molded during surgery to the patient’s cranium. Unfortunately, these implants are susceptible to bacterial growth and water absorption, which can result in infection. Another option is titanium meshes, which are expensive, fragile and difficult to work with—meaning they can often look flat or unnatural on the patient’s skull. They’re also prone to further bending or even becoming exposed through the skin, which requires additional surgery to repair or remove the damaged areas of the implant. There’s also grafting options, which involve harvesting bone from either the patient’s own body—a painful and lengthy process— or from a cadaver, which has a high risk of being rejected by the patient’s body. The final option—sometimes called a decompressive craniectomy—is often considered a last resort. To allow the brain to decompress after trauma or injury, a part of the skull is removed and then surgically implanted into the patient’s abdomen to keep the skull tissue alive. Once swelling in the brain goes down—which can take up to 20 weeks—the piece of skull is then taken out of the stomach and re-implanted. Unfortunately, the skull tissue often dies before the final transplant can be performed, making this a high-risk option. With Granta, Carlos knew that he could provide a fifth option that would be safer, easier to install surgically, and more natural-looking for the patient. But he also knew that choosing the right set of tools to design, prototype, engineer and manufacture the implants was critical. That’s when he reached out to the Autodesk Foundation. They helped Carlos and his team to find the right solutions and got them trained them up on the software. Adriana’s initial cranioplasty was performed using a PMMA implant. She seemed to be recovering well before a secondary infection occurred, which led to a buildup of fluid under the implant that damaged it to the point that emergency surgery was performed to remove it. Once again, Adriana found herself in a precarious state, and it wasn’t just affecting her physical health. It took a huge emotional toll on her and her family. She did not feel, or look, like the woman that she once was. It’s a common hardship for people who suffer trauma to the skull. Their self-esteem is impacted by their changed appearance, making it difficult to lead a regular life, or even keep their job. Adriana’s family was becoming more and more concerned, and by the time they were put in touch with Carlos, the situation was serious. 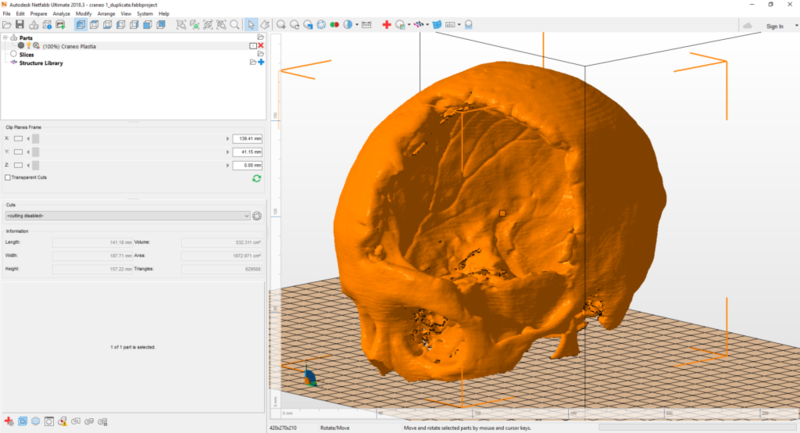 A digital model of Adriana’s skull in Autodesk Netfabb. The implant was designed to fit perfectly into the affected area of Adriana’s skull. After receiving Adriana’s case, Carlos and his team immediately got to work. They had a full suite of Autodesk software at their disposal and made good use of it. 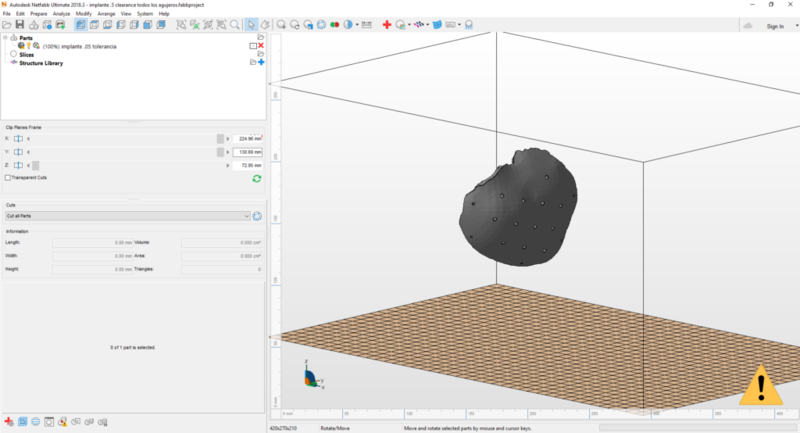 After receiving a CT scan from her doctor they converted it to point cloud data and used Autodesk Netfabb to clean and prepare the file before bringing it into design software like Autodesk Inventor or Fusion 360. It took only four minutes—something the operating team had never before experienced. Using this geometry, they designed a custom implant that would fit to the exact size and shape of Adriana’s skull. They shared the digital file and a 3D printed prototype with the surgeon, who then provided feedback about any modifications that needed to be made. Once the design was finalized, the team manufactured the implant out of PEEK (polyethyl ethyl ketone), a polymer that’s more biocompatible and less prone to infection—a much safer option than traditional acrylic implants. To do this, Granta used Autodesk Powermill to machine the PEEK with a 5-axis CNC to match the 3D model. Since the implant needs to be a perfect replica of the design, the team 3D scanned it with Autodesk ReCap, which creates a virtual model of the physical part that they can then compare to the original 3D design. Everything matched up, so in September of 2018 the implant was then shipped to the hospital to be prepared for Adriana’s surgery. Adriana’s implant is machined out of polyethyl ethyl ketone (PEEK) using a 5-axis CNC machine.A traditional cranioplasty can take upward of six hours to perform because the neurosurgeon has to spend a significant amount of time molding and shaping the implant—whether it’s made from acrylic, titanium or bone graft—to fit the patient’s skull. Time savings is a crucial factor because during the procedure the patient’s tissue is exposed to possible contaminants in the environment. With Granta’s implant, the surgeon was able to easily (and carefully) place it onto Adriana’s skull for a perfect fit. It took only four minutes—something the operating team had never before experienced. After her surgery, Adriana (left) started to feel like herself again. Adriana’s neurosurgeon, Dr. Pedro Pablo de Juambelz, was also delighted with the results. Since Adriana’s surgery, Carlos and his team have gone on to help more patients. Four more people have already received custom implants, and several other cases are in development. Every year there are thousands of surgeries in Mexico that could benefit from a custom implant. For Carlos, that means thousands of chances for him to fulfill his childhood dream of helping people.